About a week ago, Danielle was standing in line at the pasta station at Leo’s dining hall when she noticed a display of vegetables, including this GIANT white onion. I don’t know what made her take it straight from under the pasta lady’s nose, but I’m definitely glad she did. It took a long time for me to appreciate good cheese, especially anything blue and extra stinky. Maybe it’s because in my family, we didn’t really eat too many dairy products growing up. But now, there’s nothing I like better than a slab of melted brie slathered on bread. I’d done the sweet topping + brie combination before, so after picking up about a 1/4 wheel of brie at Dean and Deluca yesterday, I thought we’d go the savory route for our apartment wine and cheese night. 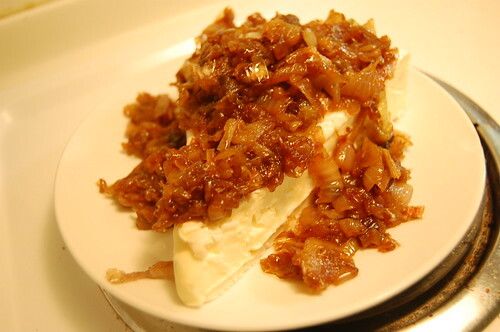 I think that caramelized onions taste pretty much good on anything, even by themselves. They take a while to make, but once you have that wonderful onion jam, you realize that the constant stirring and vigilance is completely worth it, especially when it’s combined with gooey triple cream cheese. On medium heat in a large saute pan, heat the olive oil until it begins to shimmer. Add all the onions, salt, pepper, and sugar and stir occasionally. * The key is allowing the onions to brown a little, leaving crusty goodness on the bottom of the pan and then scraping up the bits with a wooden spoon. This trick gives the onions that wonderful mahogany color. If it looks like the scraps on the bottom of the pan are about to burn, add a little water (don’t be scared of a little sizzling), and it’ll be easier to scrape them up. No matter what, you have to make sure you stir them, especially towards the end when most of the moisture from the onions has evaporated. This whole caramelizing process will take about 45 minutes to an hour, but you want to keep an eye on them; otherwise they might burn. Meanwhile, preheat the oven to 350 F. Once the onions are dark brown, place the wedge of brie on an oven-safe dish, top with the onions, and stick in the oven for 7 minutes or until it starts to get gooey, but doesn’t melt completely. Serve with the slices of baguette. 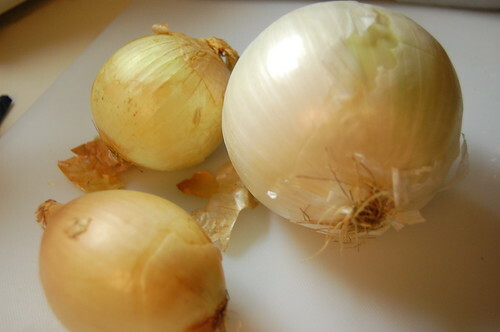 You are currently reading Story of the Leo’s onion at Notes on Food.